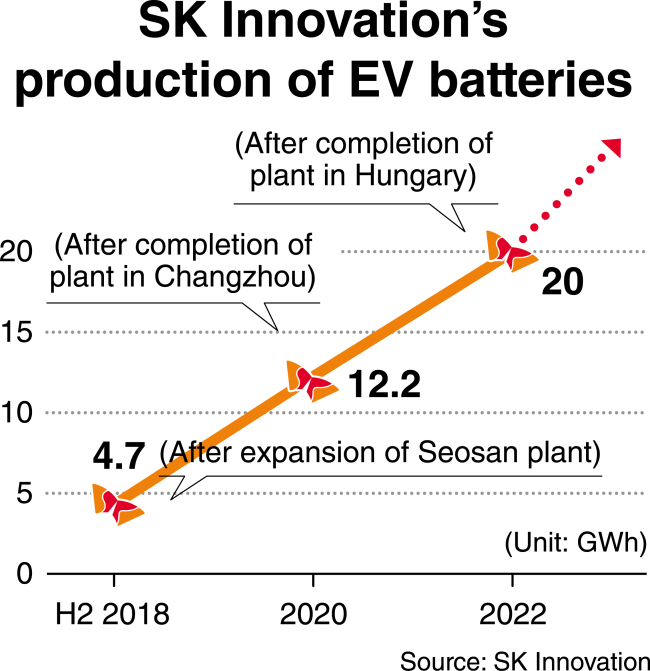 SK Innovation, a South Korean refinery and energy company, is increasing its presence in the global market for electric vehicle batteries, raising expectations it could soon catch up with leading EV makers, according to a market researcher on Thursday. A recent report by SNE Research showed SK Innovation came in at No. 6 in shipments of batteries for electric vehicles, plug-in hybrid electric vehicles and hybrid electric vehicles for the period between January and July. The company’s ranking rose one notch from the same period last year due to increased sales of some Korean EV models, including Kia Motors’ Niro PHEV, Kia Soul EV and Hyundai Motor’s Ioniq PHEV. The shipments of the SK affiliate’s EV batteries stood at 315.4 megawatt hours, marking the steepest growth of 134.8 percent in the industry among top 10 battery makers, according to the researcher. The expanded shipments raised the company’s market share from 1.3 percent to 2 percent. From January through July, combined shipments of EV batteries made by non-Chinese companies recorded 16.1 gigawatt hours, rising 54.6 percent from the same period last year. With completion of a second factory for batteries in Seosan, South Chungcheong Province, within the year, SK Innovation’s total EV battery production capacity will be ramped up to 4.7 GWh a year. By around 2022, when the company’s new plants in Hungary and China are completed, the total capacity will grow to some 20 GWh, equivalent to the power needed for about 670,000 electric vehicles.